If you are leading a B2B SaaS business today, and you are successful, then your business is on its way to commoditization. The forces of commoditization are far more powerful today than they were five years ago and they are only going to get stronger. This is a good thing in general, but a tough challenge for management and investors. Only successful services get commoditized. A commodity is something where there are near identical alternatives and widespread demand for a common set of functionality. Once a service is well understood by its developers, buyers and consumers, and provides sufficient value, it will be commoditized. The commoditized service will be cheaper and more reliable. Innovation will have moved on. Commoditization may be a general good, but it is intensely painful for companies offering the service being commoditized. Competition shifts from innovation and differentiation to price and reliability. Costs get squeezed out. Business arrangements get simplified. Brand is often used as a proxy for quality. Most of the companies that created the sector, including the early movers, get forced out. We all want our services to be successful, which means we should all be planning for the time we are commoditized. And this is likely to happen faster and faster over the next decade. Why? Yes, AI is going to drive commoditization over wide swaths of software by eliminating and automating processes. AI itself is being commoditized far faster than anyone (or at least anyone I know) expected. Two years ago we thought it would drive all sorts of differentiated new solutions. Now AI is so easy to apply, and the tools are so powerful, that it is about as differentiating as using a SQL database. AI has been incredibly successful and is moving to commoditization and dragging many other applications along with it. This was expected. Cloud computing makes it easy to scale. 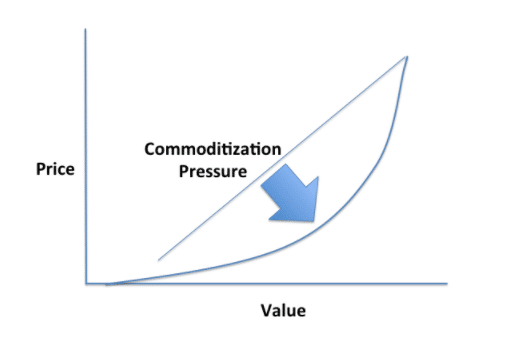 Commoditization depends on scaling. Cloud computing accelerates commodification. Well-architected software has clean, easy to understand and easy to adapt APIs. Open APIs breakdown silos and let data and functionality flow across systems. Systems become composed rather than architected. AI, cloud computing and open APIs are all feeding on each other. This opens up many opportunities for innovation, but it also accelerates the commoditization cycle. How can you tell if your offer is, or will be commoditized? One way is to look at the value map for your sector. The traditional value map, as introduced by McKinsey graphs Price to Value. Offers naturally distribute along this line (or within a zone of indifference). Discount offers are at the bottom left, premium offers at the top right. You should have a pretty good idea of what this map looks like for your sector and where your company is positioned. What we have come to realize is that in the real world this value equivalency line can be curved. 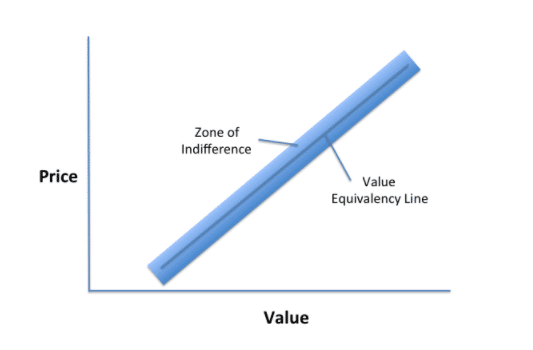 In commoditizing markets the value equivalency line becomes concave. This means that additional value is not rewarded by increased price until you get to the top end of the market. Buyers are increasingly unwilling to pay for additional functionality. It is more and more difficult to assert meaningful differentiation. The market is commoditizing. There is a common pattern to commoditization. If you see this happening in your own business, and you will at some point, act quickly. You may decide you are going to fight it out in the bottom left quadrant as a commodity provider. This means cutting costs, getting to operational excellence and being able to scale. Brands win in commoditized spaces (think about the bottled water industry). In the commoditized part of the market, companies will either need to become very large and develop powerful brands (advertising on television is one signal that a sector is commoditizing) or retreat into narrow niches. The other safe positioning, at least for a time, is in the upper right, as a highly differentiated best of breed provider. 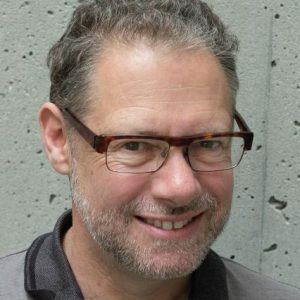 There will not be very many of these and most of them will probably end up in the orbit of one of the dominant platform companies – SAP, Oracle, Salesforce.com, Microsoft, or in some spaces, like AI, Amazon, Google and Facebook. There is a third strategy. That is to become a solution for a specific, high-value business problem, usually for a targeted set of customers. This is moving onto a new board, so to speak, and competing using business and customer knowledge. This is often the best choice. The new opportunity will usually be found within a subset of your existing clients. It means getting very close to these clients, understanding their business problems, and proposing a solution. The solution will likely be based on your current offer, with some additional functionality, and quite possibly with additional data. 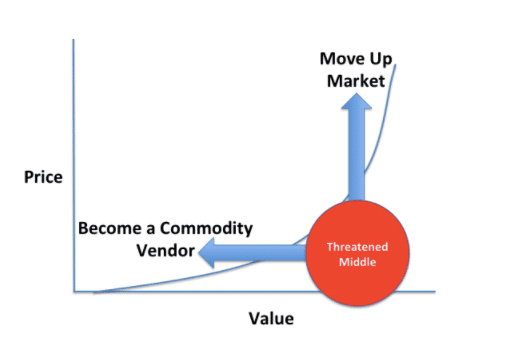 In any case, the companies that recognize commoditization early and act to avoid getting trapped in the middle will be the ones that thrive in the new market conditions.